According to a 2017 report from the Pew Research Center, Muslims are the world’s fastest growing religious group. It’s projected that at the current rate, Muslims will outnumber Christians by 2060. Even now, nearly a quarter of the world population practices Islam and there are about 50 Muslim-majority countries. But it’s hard to ignore the negativity that is far too often associated with the Muslim faith; it’s possibly the world’s most misunderstood religion. This makes it all the more important to study and explore. Traveling can introduce you to the tenets of Islam, no matter what your faith. And it doesn’t hurt that Muslims are responsible for some of mankind’s most beautiful creations. Get a taste of the Muslim religion, culture, and history with some landmarks from the Islamic world. Imam or Naqsh-e Jahan Square is surrounded by Islamic architecture icons, like the intricately tiled Naghsh-e Jahan Mosque, the six-story Ali Qapu Palace, and the Qeysarie Gate, which opens to the Esfahan Grand Bazaar. Islam traveled to China along the Silk Road. Founded in the first century, Xian’s Grand Mosque stands out among other mosques thanks to its’ Chinese-style architecture and gardens. The surrounding area’s winding alleys are full of delicious street food and restaurants. A gift to Toronto from billionaire spiritual leader and philanthropist Aga Khan IV, the park, Ismaili Centre, and Aga Khan Museum combine spirit, art, history, and nature in one place. At almost 700 feet tall, Hassan II Mosque’s minarets are the world’s tallest. Since the mosque sits on a peninsula, it resembles a giant Islamic lighthouse. Built between 1631 and 1648 by 20,000 workmen and master craftsmen, this white marble marvel honors the memory of then-emperor Shah Jahan’s favorite wife. It’s not only the jewel of Muslim art in India, but also one of the most famous Muslim landmarks in the world. Though the last Moorish ruler departed Grenada in 1492, Spain is still home to an impressive collection of Islamic sights. 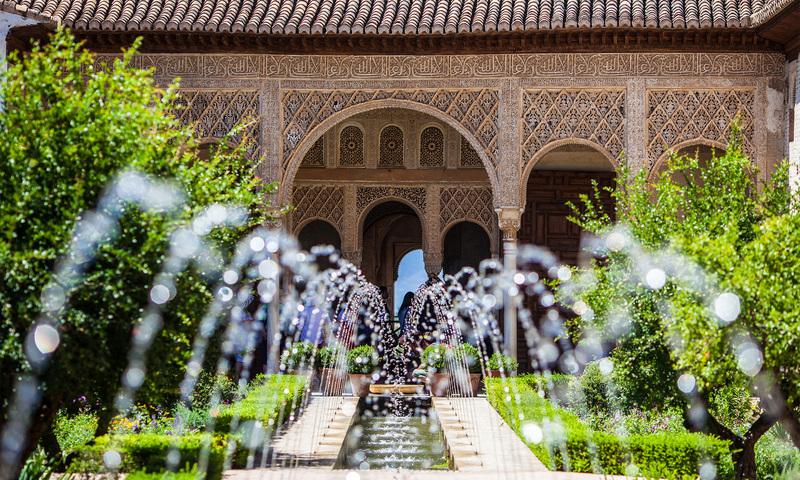 The Alhambra’s medieval courtyards, reflection pools, and ornamental garden will blow any visitor away. Located in Jabal al-Nour (Mountain of Light), this cave is where the Prophet Muhammad received his first revelation. Backpackers in South East Asia may not realize it, but Malaysia is in fact a Muslim-majority nation. Built in the 60s, the National Mosque in Kuala Lumpur showcases modernized Islamic style. The white latticework resembles Arabic calligraphy, while the pleated blue roof is modeled after an unfolding fan. The castle-like, teal-roofed mosque that stands now is actually a recent reconstruction project; the original was destroyed by Ivan the Terrible in the 16th century. The Montaza Palace along the Mediterranean coast was a summer palace for King Fuad I. The grounds and its extensive gardens are now open to the public. Featuring 82 domes, 24-karat gold chandeliers, and the world’s largest hand knotted carpet, the Sheikh Zayed Grand Mosque can hold up to 40,000 worshippers. The first ceremony was the funeral of its namesake and former United Arab Emirates president, Sheikh Zayed, who is buried at the site. The Met, Louvre, and other international museums house extraordinary Islamic art sections, but the Museum of Islamic Art in Qatar is completely focused on art from the Arab world. It houses Islamic art from three continents created over 1,400 years. The medina of Tunis dates back to the 13th century and is now a UNESCO World Heritage site. Its souk has everything from rugs to perfume, but the medina also features mosques, alleys, ancient houses, and hammams (traditional bathhouses). Poised on the spiritual Sharika Hill, Hari Parbat Fort provides Sikh, Hindu, and Muslim significance as well as panoramic views of Srinagar city and Dal Lake. The Makhdoom Sahib Shrine on the southern side is dedicated to a Sufi saint who helped spread Islam in the region. Also known as the Qasemi Bathhouse, the interior of this public Iranian bathhouse is is decorated with turquoise and gold tiles and intricate paintings. The roof is made of multiple domes that provide bathers with lighting while concealing them from the outside. 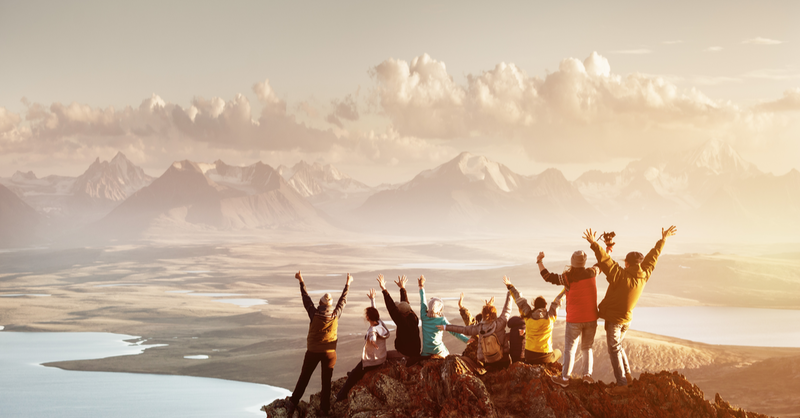 If you’re heading to these sites with your squad, be sure to check out our group travel tips so you don’t lose any friends in the process.